As safe a strategy as covered call writing is there is some risk; the risk is in purchasing the stock, not in selling the option. For this reason, some investors who sell covered calls also buy protective puts to alleviate some of the risk especially in volatile markets like we’ve experienced recently. Remember, the owner of a put option has purchased the right, but not the obligation, to SELL 100 shares of the underlying stock at the strike price on or before expiration Friday. A put option is considered in-the-money if the strike price of the put option is higher than current market value of the underlying stock. Likewise, a put option is considered out-of-the-money if the strike price of the put option is lower than the current market value of the underlying equity. You will note that the in-the-money and out-of-the-money strike/share value relationships are opposite for calls and puts. A protective put is a put option that is purchased for an underlying stock that is already owned by the put buyer. It defends against a decrease in the share price of the underlying security. When a protective put is used in conjunction with covered call writing, the strategy is referred to as a collar strategy. A collar is the simultaneous purchase of a protective put option and the sale of a covered call option. In a true collar strategy, the puts and calls are both out-of-the-money and have the same expiration dates and an equal number of contracts. Thus, we sell an out-of-the-money call and add additional downside protection for the underlying equity by purchasing a protective put option. As demonstrated in the chart above, the profit potential of an otherwise normal covered call position (dotted line) is muted due to the additional cost of purchasing the protective put (solid line); however, the protective put also gives us downside protection at the strike of the put. If you exit the covered call position early, you can sell the remaining protective put, thus slightly improving your return. The use of protective puts when covered call writing will decrease downside risk but also result in a lower initial premium return. The collar strategy is particularly useful in volatile or bearish markets. There are other strategies that can be executed during volatile market conditions. These are detailed in the BCI Emergency Management Report located the “resources/download” section of the premium site. Live in the Chicago area? For the week, the S&P 500 fell by 1.5% for a year-to-date return of 14%, including dividends. BCI: Despite the favorable economic reports, the disappointing earnings and market volatility dictates taking a defensive posture favoring in-the-money strikes, low-beta stocks and ETFs. Less experienced investors should consider keeping at least a percentage of their portfolios in cash until volatility subsides. East coast members please stay safe as the storm passes. The Weekly Report for 10-26-12 has been uploaded to the Premium Member website and is available for download. Thanks for another informative article. I have a question about page 192 of your Encyclopedia book. You say “I like to see an OI of at least 100 contracts and/or a bid-ask spread of 30 cents or less” Why is there is no mention of volume? Thanks again. I view OI as a more reliable stat in determining option liquidity than is volume. This is because OI is cumulative and volume stats are reset each day. Since OI is in a constant state of flux, we do NOT publish this figure in our premium reports as we don’t want to eliminate an equity/option combination based on a number that can change day-to-day. 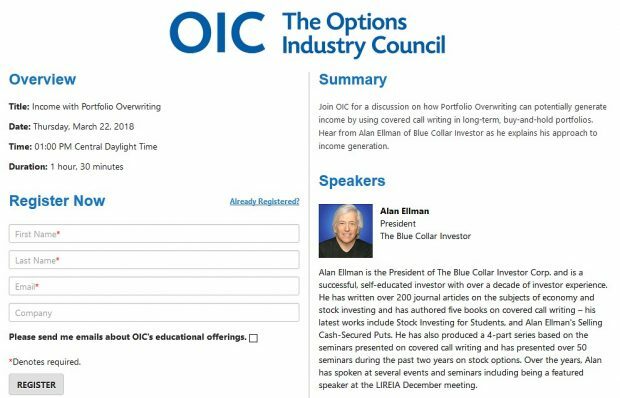 OI should be checked at the same time you are accessing the bid-ask spreads from any options chain. Numbers aren’t my strength but I’m getting the hang of these calculations and the ellman calculator. Can you confirm these numbers for gdxj from the etf list. Your calculations are perefect! Keep up the good work. Alan, I have thought about collars off-and-on for some time but have never used them. Your article is giving me another opportunity to think about them and I have a question, albeit a not very well thought through question. My biggest problem with covered calls has been the times when the stock price makes an unexpected fall. “Every” month I manage to pick the one that does this. So I’ve thought about how to manage this risk. Let’s say we modified the BCI methodology to reduce downside risk by “always” using a collar. And let’s further say that as a trade-off for reducing the downside risk we were willing to target the lower end of the BCI methodology target monthly ROR range, e.g., 2%/month. By using a collar we know the max loss, max gain, and with the deltas we also know the probabilities of the stock price finishing OTM on each side of the collar. Would this give us enough information to calculate the probability of say a 2% return? If yes, then I’m wondering if there would be another tab in the Ellman calculator that could be created that would use the call and put price along with their associated deltas to calculate the probability of getting the 2% return. The beauty of this is one could pick strike prices based on statistics rather than simply going ITM or OTM based an educated guess of the market direction. Plus, it would define and limit the downside risk. The use of collars certainly has its appeal when it comes to avoiding catastrophic losses. It is also a sensible approach for low-risk tolerant investors and in voltile market conditions. Your concept of adding collars to the calculator and perhaps factoring in deltas is interesting and actually something we have been discussing (the delta concept adds a new dimension). I have already made a note of it to discuss with my team (need the lights on first!). We appreciate member suggestions like yours and as a result have a list that we will address and perhaps incorporate into the BCI methodology. These ideas will ultimately make us all more successful investors. We are in the midst of a huge hurricane here in NY so please understand if our on and offline responses are delayed. Please stay safe. We have none. Our repsonses to on and offline inquiries will be swift once power returns (what a mess!). Hope you are safe and well. On October 25th 3D Systems Corp.reported a positive 3rd quarter earnings report with earnings up 82% year-to-year and revenues up 57%. This represented a 15.4% positive surprise with a long-term projected growth rate placed @ 17.6%. 3D Systems ended the quarter with a cash balance of $184 million. Our premium “running list” shows an industry segment rank of “A” and a beta of 1.71.